The bones in her jaw had been shaved away with a razor, the original broadness chiseled into petite features, not found often in nature. Her fingers ran along her jaw, where she felt blunt edges instead of the sharp ones that had been there before. She eased herself off her twin sized bed, her feet landing on the chilled tile, her body feeling aberrant in the clean apartment. Gazing at the floor, she felt the coldness of the white tile and the sterileness of the sparsely furnished room. She recalled that she had chosen this decor because of its simplicity and how easy it was to clean, but while she looked at the egg-shaped chairs and the pyramid-like dresser, her room began to feel like a modern art museum, where none of the exhibits were supposed to be touched. Lexis had not seen her face since the surgery. Her mother had said, "If you can't see the pain, it won't exist." She pondered the looks she would get when she revealed herself for the first time, the debut of a new era, one without asymmetry and anything less than the golden ratio. She then imagined calling her mother, who would jump in delight and demand many photos of her new, pretty daughter. Her mother would thank her for going through with it, insisting the money had been well spent, delighted her daughter had been so compliant. "Hey, fetus." Her sister, Brandy, poked her head through the door, a sly smile on her lips. "Seems like the swelling's almost gone." Brandy slid through the open doorway, revealing two mugs in her hands, one of hot chocolate the other of milk tea, both emitting small puffs of steam that twisted like dye through water. "Yeah, I think everything’s going as planned. I’m just about healed." Lexis shifted her body back onto her bed, allowing her legs to dangle off the side. She patted the open space and allowed her sister to take a seat beside her. "Oh? In time for...?" Brandy handed the milk tea over to her. The blue mug depicted a cartoon cat with a cactus beside it. Lexis shot her sister a look. "You know the answer." "Fifty three," Lexis sighed and took a sip out of her mug, lifting herself off the bed and standing. "And I'm giving her just what she's always asked for." Lexis treaded across the room. The space was awkward, with the bed shoved into the corner and a bookshelf at its base. A desk had been placed in the opposite corner of the bed, and it was kept neat and tidy, free of clutter, a laptop in its empty space. Despite the room's small area, there was plenty of room for movement, maybe a cartwheel or two across and a cartwheel wide. Lexis no longer felt lightheaded from pain, and the nausea had diminished about a week before. She drifted into the windowless bathroom, where darkness concealed the mirror. The washroom remained pitch black with the lights off. Lexis closed the door behind her, and in the dark she fumbled to locate the light switch. She flipped the light on but kept her eyes closed, scrunched. She was too cowardly to look at herself; she could look like anything, and she feared that she would soon regret the decision she had made. Maybe she could just avoid mirrors for the rest of her life. Coming to her senses, she took a peek at herself. In the mirror, her reflection had changed itself entirely. Everything about her had altered. If her face had been a complete puzzle, she now looked as if some of the pieces had come from the wrong box. Her jaw had been shaved down to a soft point, its bone structure no longer seeming capable of supporting the weight of her head, despite its aesthetic lines and nearly perfect curves. Her eyes had been drawn into impeccable arcs, scarred and beautiful, still slightly puffy, but too similar to the eyes of others, not to mention strangely doll like. Lexis hadn't seen her face in weeks, but truthfully, she would never see her face again as long as she lived. There were temporary surgeries, but not the kind she had received; these were the features that would hold on to her like a scarring childhood memory. Not her eyes nor her chin, not even her temples, shaved into petite curves that connected to her jaw, would ever revert back to their previous, edgy variations. “The true definition of beauty is bowed, rounded features,” her mother had said, the kind that Lexis had now, the kind her mother always ranted about. While she made her daughter omelets, she’d explain how these features were nonexistent in her family tree. Because of the surgery, her mother's thirst for beauty would be quenched, and all would be well. As she backed away from the mirror, her breaths quickened. "Yeah," but she wasn’t. She exited the bathroom without looking at her sister; if she did, she would surely cry. Lexis was still in her pajamas when she strode across the cold tile floor to her third-story balcony. Her hair was thick and healthy, falling to the bottom of her ribcage, but it was mangled and oily after weeks without washing. It was, however, the ideal length for a young woman her age, the length in every magazine and on every celebrity and on every female in her profession. But as she stepped onto the balcony and tried to close the door behind herself, her long locks got caught between the door and the frame. Without thought, she yanked her hair away from the door, as the pain couldn’t have been worse than surgery. Outside, the wind blew with force at her and at the pedestrians below, the men offering jackets to their one-and-onlys, the couples strolling a little bit faster. Wrapping a robe around her thin frame, she took a careful step toward the railing, her bare feet on concrete. The clinic had scrubbed all of her old skin off, removed moles and scars like unwanted toppings on a cake, until she was left with flawless skin, red and irritated, but flawless. The UV rays from the sun would surely worsen her new skin. The cruel outside world wasn't meant for her smooth, raw edges now that she had let herself be neutered by her own mother. Lexis pulled her robe high, covering her neck and her sensitive jawline. She tugged it over her tender nostrils, and in the new world she felt bare and exposed, more insecure than she had felt before the knife. People passed by on the sidewalk below, the busy intersection nearby full of curious citizens. Across the street, a group of businesswomen waited for the light to change. Their features were strangely uniform but their skin was smooth and their eyes were massive and exotic like those seen in paintings. Their waistlines were corset trained and their legs had missing parts, thick flesh and unwanted muscles professionally excised. They held purses and traveled in a cluster, wearing bright pumps and high buns. They were beautiful. But they had been touched. Their eyebrows had been tattooed into straight, angled lines, clean and groomed, maintained like a first place county fair horse. The last of their individuality had been dyed into brunette locks, developed and bleached, just like their skin. On the balcony, Lexis drowned in the beauty, overwhelmed by the smells and burning bits of gorgeous life that surrounded her. Currents of unknown forces tugged at her skin and her heart palpitated at the thought of what she had done for her mother. She recalled Victor Hugo: “To love beauty is to see light.” But as Lexis gazed at the women disappearing into buildings, her lips parted, inhaling the cold asphalt, dark alleys, and the lovely asymmetrical trees. She felt a foreign tingling sensation in her skin, as if her new face were just a bitter allergy that she could outlive, and her hand reached up to warm herself only to find a stranger’s nose, cheeks, and chin instead of the old ones she so dearly missed. She briefly considered calling her mother. But her hands stayed glued to her face. Maybe this new face of hers would fade over time or maybe it’d fall off like the scab that it was. Her mother was probably waiting for her “Happy birthday” call, wondering if her daughter had forgotten the special day, but instead, it was all she could think about. Because of her mother, she had been tamed, seduced into a silver cage that society beckoned her into, and despite her beautiful face, all she could feel were the scars. 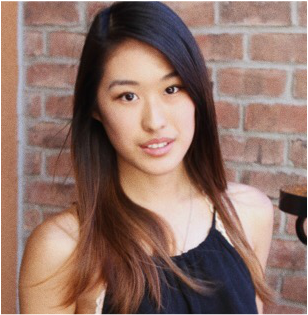 BIANCA ZHOU, currently writing in the east bay, is a sixteen year old artist who enjoys poetry and short story fiction. She has attended the California State Summer School for the Arts as well as the Sarah Lawrence Writers Village in New York. She is a recognized California Arts Scholar, Grand Champion of the Walt Whitman Poetry Contest of 2016, and a recipient of numerous awards from the Scholastic Arts and Writing Contest.